Imagine the thrill of jumping onto a four wheel motorcycle or quad bike for an adventure second to none. Quad biking is fun and a great way to experience the outdoors with friends or family. 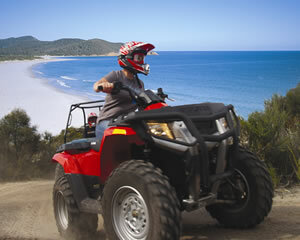 Quad biking in Port Stephens at Nelson Bay or Shoal Bay, plus at and Kangaroo Island is terrific fun. You can hire quad bikes in Darwin and the Northern Territory and all other capital cities including Sydney, Adelaide, Hobart, Melbourne, Perth and Brisbane. 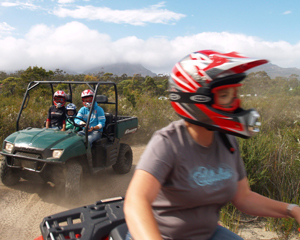 Quad biking involves riding quad bikes along a track or in some cases the beach. Safety gear and a full safety brief is provided before your quad biking adventure commences. So go on - try riding a quad bike today. You wont be disappointed! Enjoy an hour exploring 400 acres of bush trails. 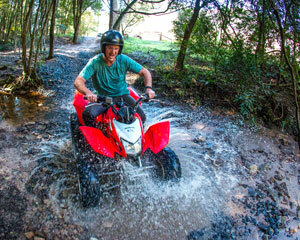 Jump on board our current model quad bikes for a safe eco trail adventure. Fun for the whole family. Come riding with us on 450 acres of exhilarating off road tracks. No previous experience is required as bikes are fully automatic, just a desire to do something different, challenging and above all fun. 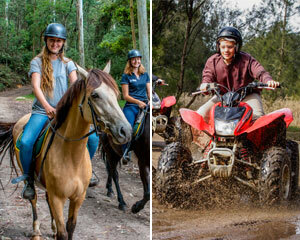 This 1hr Horse Riding and 1.5hr Quad Biking combo is an Adrenalin-fuelled escape, just 40-minutes North of Sydney. Half day Jet Ski, half day Quad Bike - the ultimate adventure! 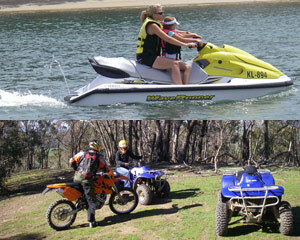 Fully automatic quad bikes and jet skis that are easy to use. Come and see the wildlife of Kangaroo Island, home to Kangaroos, Koalas, Wallabys, Sea Lions, Seals,Echidnas, Goannas and more. Enjoy a great mixture of action and adventure including Sand Boarding, Surfing, Snorkelling, Hiking, Fishing and great times! A true Tasmanian bush adventure. Enjoy a 1 hour ATV tour riding along numerous bush tracks, hidden gullies and open pasture. Scenic countryside and an adrenalin rush is guaranteed! Price is inclusive of Quad bike hire, all safety equipment, wet weather gear and refreshments. This is the ultimate 10 day adventure. Travel from Perth to Broome and visit the Pinnacle Desert, Kalbarri National Park, the Monkey Mia dolphins, Coral Bay, Exmouth, Karijini National Park and 80 Mile beach. Snorkel, swim, sandboard and much more - this tour's got the lot! A combination of adventure and picturesque scenery as you enjoy an exhilarating ride along secluded bush tracks of the world renowned Freycinet National Park in Tasmania. Get ready to have the most fun you can have on four wheels as you ride around bush trails and open paddocks on the back of a quad bike! With no prior experience necessary and only an hour from Sydney on the Central Coast, you're guaranteed to have a great time rushing around on the back of an ATV! Get face to face with nature cruising through the rainforest on your own powerful quad bike (All Terrain Vehicle). This adventure is excitement plus, and takes in some amazing scenery whilst allowing you to enjoy the thrill of full throttle. Do you have a taste for adventure and love the outdoors? 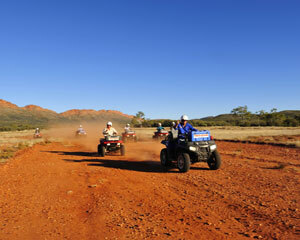 Experience some of the most beautiful scenery Alice Springs has to offer on a quad bike adventure. Travel over bush tracks of varied terrain, down dry river beds passing majestic river gums and ride beside ancient mountain ranges. 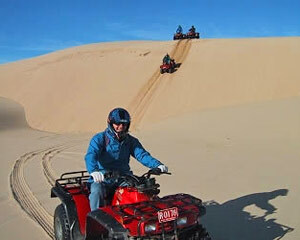 Quad bike the outback; travelling varied terrain and viewing abundant wildlife. The safaris take place on a unique private working cattle station, giving you first hand impressions of its vastness. You'll ride over dry riverbeds, along bush tracks and pass along the majestic East MacDonnell Ranges. A half-day combination of adventure and picturesque scenery as you enjoy an exhilarating ride along secluded bush tracks of the world renowned Freycinet National Park in Tasmania. See Freycinet National Park in a way like no other! Riding your own all-terrain vehicle to isolated parts of the famous reserve, you will see magical beaches and spectacular granite sea cliffs. This fully guided ATV tour gives you a truly special insight into this rarely seen coastal environment. Enjoy the adventure of riding your own all-terrain vehicle to isolated parts of the Freycinet National Park. Riding on ATVs, you will discover Freycinet's magical beaches and spectacular granite cliffs on a fully-guided tour, getting a truly special insight into this rarely seen coastal environment. 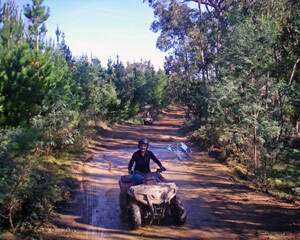 This 2.5hr ATV (All Terrain Vehicle) quad bike adventure in Melbourne will blow your socks off! We use fully automatic quad bikes so no need to worry about motorcycle-style gear changes! This half day ATV (All Terrain Vehicle) quad bike adventure in Melbourne will blow your socks off! We use fully automatic quad bikes so no need to worry about motorcycle-style gear changes! 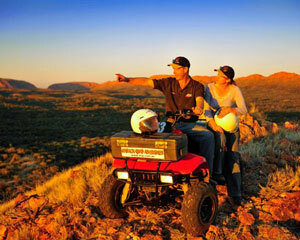 Experience the unique scenery of the Red Centre on your own easy to operate 4-wheel quad bike! 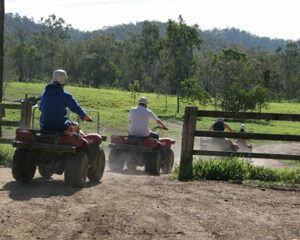 Safety training is provided and before long youre ready to take off on your quad bike. Get face to face with nature cruising through bushland on your own powerful ATV (all terrain vehicle). This adventure takes in some amazing scenery along the way. 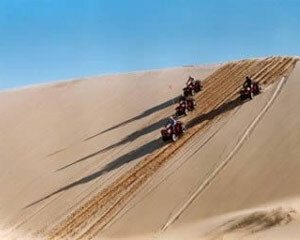 This full day ATV (All Terrain Vehicle) quad bike adventure in Melbourne will blow your socks off! We use fully automatic quad bikes so no need to worry about motorcycle-style gear changes! Quad Bike adventures done right! Discover the Stockton Bight Sand Dunes in a magical way, as you are guided on a Quad Bike through the largest moving coastal sand mass in the southern hemisphere, dating back over 2,500 years. If you're looking for some 'serious fun', come Quad Biking. Imagine riding through 3,000 acres of natural wilderness, including bushland and mountain trails on your own easy to use quad bike. Riding your own 4 wheel motorcycle (ATV) through the unique Australian bushland and mountain trails is an exciting way to experience the stunning scenery. Give the kids the adventure of a lifetime next School Holidays with this Maximum Adventure Camp, just 1 hour north of Sydney. 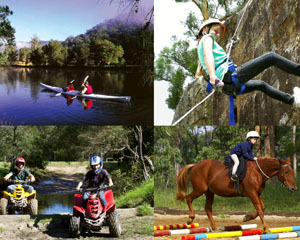 Kayak, abseil, ride horses or go quad biking! 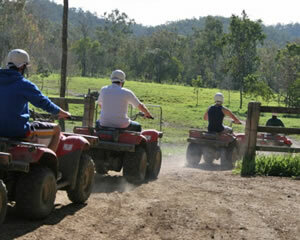 Quad bike the outback; travelling varied terrain and viewing abundant wildlife. The safaris take place on a unique private working cattle station, giving you first hand impressions of its vastness. You'll ride over dry riverbeds, along bush tracks and travel into the ancient East MacDonnell Ranges.